Kerri Hardwick grew up being immersed in music. She went to Virginia Wesleyan College and graduated with a BA in Music. 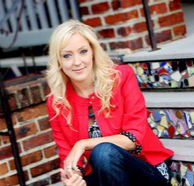 She has worked in various ministry setting including serving St. Paul’s UMC in Chesapeake, Virginia as their Minister of Music, and most recently as a music teacher at Christ the King School in Norfolk, Virginia. Kerri began her ministry at The Lampstand in January of 2013. Learn more about Kerri and her Voice Studio.